Former McCain campaign staffer Nicolle Wallace tore into Sarah Palin’s “Going Rogue” Tuesday night, saying the book was “based on fabrications” and exhibited a “bizarre fixation” on past events. Republican vice presidential candidate Alaska Gov. Sarah Palin, sits in a vehicle on Sunday, Aug. 31, 2008 with Steve Schmidt, chief strategist for the McCain campaign at the Republican National Convention in Minnesota. To read Sarah Palin‘s shockingly shallow Going Rogue, one is immediately struck by how nasty and vindictive Palin is, and that her book is little more than a veiled mechanism for settling scores with old foes who have triumphed over her throughout Palin’s lifetime. Is Palin really going rogue? Hardly. Getting even is more like it. Palin’s biggest score to settle is with those senior advisers–Republicans all–in the John McCain campaign, on whose shoulders Palin lays the blame for her failed and tortured debut on the American political stage last fall. Most notable among them, of course, is “The Bullet,” Steve Schmidt, who took over McCain’s teetering campaign in July of 2008 and was a staunch advocate of Palin’s selection as McCain’s running mate. "Sarah From Alaska" by Scott Conroy and Shushannah Walshe. There are only so many hours in the day, and we want to help you. So here’s the first in an occasional series rounding up what you need to know about big politics books you want to read, if only you could find the time. In between election returns, we read “Sarah From Alaska” by Scott Conroy and Shushannah Walshe, two reporters who covered last year’s presidential race. It’s out now from PublicAffairs Books (with the teasing subtitle, “The Sudden Rise and Brutal Education of a New Conservative Superstar”). We found enough in it to sustain a week of cocktail conversations. 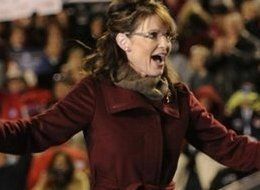 — No concession on the concession: Palin wanted to give a concession speech, but that was nixed by McCain and his aides. It had been written by former Bush speechwriter Matthew Scully, and would have had her say, “when a black citizen prepares to fill the office of Washington and Lincoln, that is a shining moment in our history that can be lost on no one.” And Palin would have offered her own lavish praise for Obama and his “beautiful family,” McCain and the “honor of a lifetime” that he had given her, and a shout-out to a boy with Down syndrome who she had met on the campaign trail. McCain and his staff were adamantly opposed, though the authors offer no real explanation beyond the general friction between the McCain and Palin camps by the end of the campaign. Exiting Alaska Governor Sarah Palin. On Monday, Eric Boehlert highlighted Time‘s upcoming cover story on Sarah Palin, titled, “The Outsider: Where is Sarah Palin Going Next?” While Palin has certainly received her share of bad press, a great deal of it has been the inevitable result of her own statements and actions. Interpretive articles like this one, however, are different and provide journalists with the chance to use their judgment to put past actions and ongoing trials in a broader context that will help readers better understand the subject at hand. Which is why this article is so problematic. In it, Time‘s David Von Drehle and Jay Newton-Small go to immense lengths to create a story out of thin air. In this case, it’s “The Renegade,” a tale about an unconventional politician making waves with her unpredictable behavior. The piece is deeply flawed, advancing conservative narratives without challenge and ignoring obvious realities about Palin, her home state, and the problems she faces. It’s an account that flies in the face not just of progressive criticisms of the governor, but of a growing chorus of conservative ones as well. And it is exactly the kind of ratings-driven journalism that is, ironically, making magazines like Time less and less authoritative at a time when serious journalism couldn’t be more needed. I’m sympathetic to Eskew and Wallace, and not just because they’re decent people. They’ve held their tongue from leaking what a couple of McCain higher-ups have told me–namely, that Palin simply knew nothing about national and international issues. Which meant, as one such adviser said to me: “Letting Sarah be Sarah may not be such a good thing.” It’s a grim binary choice, but apparently it came down to whether to make Palin look like a scripted robot or an unscripted ignoramus. I was told that Palin chafed at being defined by her discomfiting performances in the Couric, Charlie Gibson, and Sean Hannity interviews. She wanted to get back out there and do more. Well, if you’re Eskew and Wallace, what do you say to that? Your responsibility isn’t the care and feeding of Sarah Palin’s ego; it’s the furtherance of John McCain’s quest for the presidency. Draper also reports that McCain snubbed Palin during a long ride on the Straight Talk Express.